Basil of Caesarea (ca. 330 - January 1, 379 C.E.) (Latin: Basilius), also called Saint Basil the Great (Greek: Άγιος Βασίλειος ο Μέγας), was the Bishop of Caesarea and a leading churchman in the fourth century. The Eastern Orthodox Church and Eastern Catholic Churches consider him a saint and one of the Three Holy Hierarchs (together with Gregory Nazianzus and John Chrysostom). Likewise, the Roman Catholic Church considers him a saint and a Doctor of the Church. In addition to being recognized as one of the Cappadocian Fathers (along with Gregory Nazianzus and Gregory of Nyssa), a group that did much to define the ultimate form of Christian theology, Saint Basil also codified the regulatory precepts for eastern monasteries in his Ascetic Rule, or Ascetica, which is still used today in the Eastern Orthodox Church. The Basilian Fathers, an international order of Roman Catholic priests and students studying for the priesthood, are named in honor of the great saint's exemplary theological and scholarly accomplishments. Basil was born between 329 and 333 C.E. at Caesarea Mazaca in Cappadocia. One of ten children, he came from a wealthy and pious family which produced a number of saints, including his father, also named Basil, his mother Emelia, grandmother Macrina the Elder, sister Macrina the Younger, and brothers Gregory of Nyssa and Peter, who became Bishop of Sebaste. While still a child, Basil's family moved to Capernaum, though he soon returned to Cappadocia to live with his mother's relations and seems to have been brought up by his grandmother, Macrina. During this period, he played a central role in the spiritual education of his younger siblings (a contribution that was most notable in the case of Gregory). In his early adulthood, Basil set out to further his intellectual ambitions, spending approximately five years between Constantinople and Athens, where he studied alongside Gregory Nazianzus and became friends with the future emperor Julian. Both men were deeply influenced by Origen, and are said to have collaborated on an anthology of Origenian thought called the Philokalia. It was in Athens that he seriously began to consider the religious life, which eventually prompted him to seek out the most famous hermit saints in Syria and Arabia, in order to apprentice himself to their exemplary mode of ascetic piety. In spite of this newfound impetus towards religious askesis, the saint made one final overture to secular life during this period, opening a school of oratory and practicing law in Ceasarea. After this we find him at the head of a convent near Arnesi in Pontus, in which his mother Emelia, now a widow, his sister Macrina and several other ladies, gave themselves to a pious life of prayer and charitable works. Eustathius of Sebaste had already labored in Pontus in behalf of the anchoretic life, and Basil revered him on that account, although they differed over dogmatic points, which gradually separated these two men. It was here that Basil wrote his documents regarding communal living, which are accounted as being pivotal in the development of the monastic tradition of the Eastern church and have led to his being called the "father of Eastern communal monasticism". Siding from the beginning and at the Council of Constantinople in 360 with the Homoousians, Basil went especially with those who overcame the aversion to the homoousios in common opposition to Arianism, thus drawing nearer to Athanasius of Alexandria. Like Athanasius, he was also opposed to the Macedonian heresy. Basil's endorsement of this theological position also estranged his bishop, Dianius of Caesarea, who had subscribed only to the Nicene form of agreement. The two only became reconciled as the elder lay upon his deathbed. He was ordained presbyter of the Church at Caesarea in 365 C.E., and his ordination was probably the result of the entreaties of his ecclesiastical superiors, who wished to use his talents against the Arians. This was a particularly tactical choice, as the schismatic sect was particularly influential in that part of the country and were favored by the Arian emperor, Valens, who then reigned in Constantinople. Basil at this time took on functional administration of the Diocese of Caesarea. In 370, Eusebius, bishop of Caesarea, died, and Basil was chosen to succeed him. It was then that his great powers were called into action. Caesarea was an important diocese, and its bishop was the ex officio exarch of the great diocese of Pontus as well. Hot-blooded and somewhat imperious, Basil was also generous and sympathetic. His zeal for orthodoxy did not blind him to what was good in an opponent; and for the sake of peace and charity he was content to waive the use of orthodox terminology when it could be surrendered without a sacrifice of truth. With all his might he resisted the Emperor Valens, who strove to introduce Arianism into his diocese, and impressed the emperor so strongly that, although inclined to banish the intractable bishop, he left him unmolested. To save the Church from Arianism, which in denying the divinity of Christ is considered one of the most damaging heresies to the Church, Basil entered into connections with the West, and with the help of Athanasius, he tried to overcome its distrustful attitude toward the Homoiousians. The difficulties had been enhanced by bringing in the question as to the essence of the Holy Spirit. Although Basil advocated objectively the consubstantiality of the Holy Spirit with the Father and the Son, he belonged to those, who, faithful to Eastern tradition, would not allow the predicate homoousios to the former; for this he was reproached as early as 371 by the Orthodox zealots among the monks, and Athanasius defended him. His relations also with Eustathius were maintained in spite of dogmatic differences and caused suspicion. On the other hand, Basil was grievously offended by the extreme adherents of the Homoousian doctrine, who seemed to him to be reviving the Sabellian heresy. Basil is known to have exchanged letters with Pope Damasus in the hope of having the Roman bishop condemn heresy wherever found, both East and West. The Pope's apparent indifference disturbed the zealous bishop, who then retreated from his former Basil's zeal and he turned around in distress and sadness. It is still a point of controversy over how much he believed the Roman See could do for the Churches in the East, as many Catholic theologiansclaim the primacy of the Roman bishopric over the rest of the Churches, both in doctrine and in authoritative strength. He did not live to see the end of the unhappy factional disturbances and the complete success of his continued exertions in behalf of Rome and the East. He suffered from liver illness and his excessive asceticism seems to have hastened him to an early death. A lasting monument of his episcopal care for the poor was the great institute before the gates of Caesarea, which was used as poorhouse, hospital, and hospice. 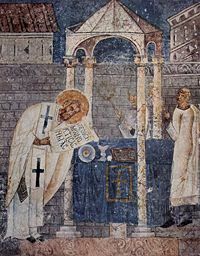 Fresco of Basil the Great in the cathedral of Ohrid. The principal theological writings of Basil are his De Spiritu Sancto, a lucid and edifying appeal to Scripture and early Christian tradition (to prove the divinity of the Holy Spirit), and his Refutation of the Apology of the Impious Eunomius, written in 363 or 364, three books against Eunomius of Cyzicus, the chief exponent of Anomoian Arianism. The first three books of the Refutation are his work; the fourth and fifth books that are usually included do not belong to Basil, or to Apollinaris of Laodicea, but probably to Didymus of Alexandria. Saint Basil of Caesarea also codified the precepts for these eastern monasteries in his Ascetic Rule, or Ascetica, which is still used today in the Eastern Orthodox Church. He was a famous preacher, and many of his homilies, including a series of Lenten lectures on the Hexaëmeron, and an exposition of the psalter, have been preserved. Some, like that against usury and that on the famine in 368, are valuable for the history of morals; others illustrate the honor paid to martyrs and relics; the address to young men on the study of classical literature shows that Basil was lastingly influenced by his own education, which taught him to appreciate the propaedeutic importance of the classics. His ascetic tendencies are exhibited in the Moralia and Asketika (sometimes mistranslated as Regulae), ethical manuals for use in the world and the cloister, respectively. In the case of the second work, which exists in two versions (the Greater Asketikon and the Lesser Asketikon), the shorter of the two is more often regarded as an authentic Basilian composition. It is in the ethical manuals and moral sermons that the practical aspects of his theoretical theology are illustrated. So, for example, it is in his Sermon to the Lazicans that we find Saint Basil explaining how it is our common nature that obliges us to treat our neighbor's natural needs (e.g., hunger, thirst) as our own, even though he is a separate individual. Later theologians explicitly explain this as an example of how the saints become an image of the one common nature of the persons of the Trinity. His three hundred letters reveal a rich and observant nature, which, despite the troubles of ill-health and ecclesiastical unrest, remained optimistic, tender and even playful. His principal efforts as a reformer were directed towards the improvement of the liturgy, and the reformation of the monastic orders of the East. Most of the liturgies bearing the name of Basil, in their present form, are not his work, but they nevertheless preserve a recollection of Basil's activity in this field in formulating liturgical prayers and promoting church-song. One liturgy that can be attributed to him is The Divine Liturgy of Saint Basil the Great, a liturgy that is somewhat longer than the more commonly used Divine Liturgy of John Chrysostom; it is still used on certain feast days in most of the Eastern Rite Catholic Churches and the Eastern Orthodox Church, such as every Sunday of Great Lent. All his works, and a few spuriously attributed to him, are available in the Patrologia Graeca, which includes Latin translations of varying quality. No critical edition is yet available. Several of Saint Basil's works have appeared in the late twentieth century in the Sources Chrétiennes collection. In Greek tradition, Basil's name is given to Father Christmas, and he is thought to visit children and deliver small presents every first of January. Saint Basil's Day, which coincides with the Greek New Year, is a joyful festival of peace, fellowship, and renewal. ↑ Though not formally canonized, his younger brother Naucratius (who died while relatively young) was also known for his dedication to Christ, and his influence on Basil was rather dramatic J. Emile Pfister. "A Biographical Note: The Brothers and Sisters of St. Gregory of Nyssa." Vigiliae Christianae 18(2) (June 1964), 110-112; see also, ff. 2 (below)). ↑ St. Basil the Great at Catholic Online. Butler, 539. In some accounts, the saint is impelled to adopt a religious life by the entreaties of his sister, Saint Macrina (as per Butler). Likewise, others suggest that it was the unexpected death of Naucratius (the saint's younger brother) that caused him to heed his sister's words (as described in Glimpses #123 - "An Incredible Fourth Century Family." Christian History Institute (2007)). ↑ Donald Attwater and Catherine Rachel John. The Penguin Dictionary of Saints. 3rd ed., (New York: Penguin Books, 1993). 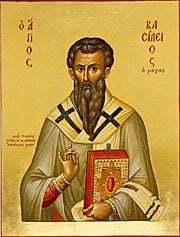 ↑ January 2 Saint Basil the Great (329-379) at American Catholic.org. Retrieved October 4, 2007. ↑ Joseph McSorley. (Transcribed by Janet Grayson) The Catholic Encyclopedia, Volume II. (New York: Robert Appleton Company, 1907) article on Saint Basil makes such a claim: .Retrieved October 4, 2007. ↑ For more information on Saint Basil's Day, see Saint Basil Academy, (Garrison, NY)  Vasilopita, Retrieved October 4, 2007.Sfakia-Crete.Retrieved October 4, 2007. and Central Valley Christian Schools .Christmas pages. Visalia, California. All links retrieved September 23, 2007. Baring-Gould, S. (Sabine). The Lives of the Saints. With introduction and additional Lives of English martyrs, Cornish, Scottish, and Welsh saints, and a full index to the entire work. Edinburgh: J. Grant, 1914. Butler, Alban. Lives of the Saints. Edited, revised, and supplemented by Herbert Thurston and Donald Attwater. Montreal: Palm Publishers, 1956. Farmer, David Hugh. The Oxford Dictionary of Saints. Oxford; New York: Oxford University Press, 1997. ISBN 0192800582. McSorely, Joseph. "St. Basil the Great" in the Catholic Encyclopedia. 1907. Pfister, J. Emile. "A Biographical Note: The Brothers and Sisters of St. Gregory of Nyssa." Vigiliae Christianae 18 (2) (June 1964), 108-113. All link retrieved May 13, 2016. History of "Basil the Great"
This page was last modified on 13 May 2016, at 21:13.